The end of the school year is approaching and with it comes talk of summer plans, classroom assessments, field trips, crazy hair day, school dances, the end of homework, and playing with rhubarb in the kitchen. I have already created a rhubarb jam that is now my favorite topping for french toast, waffles, toast, ice cream and anything else I can think of. 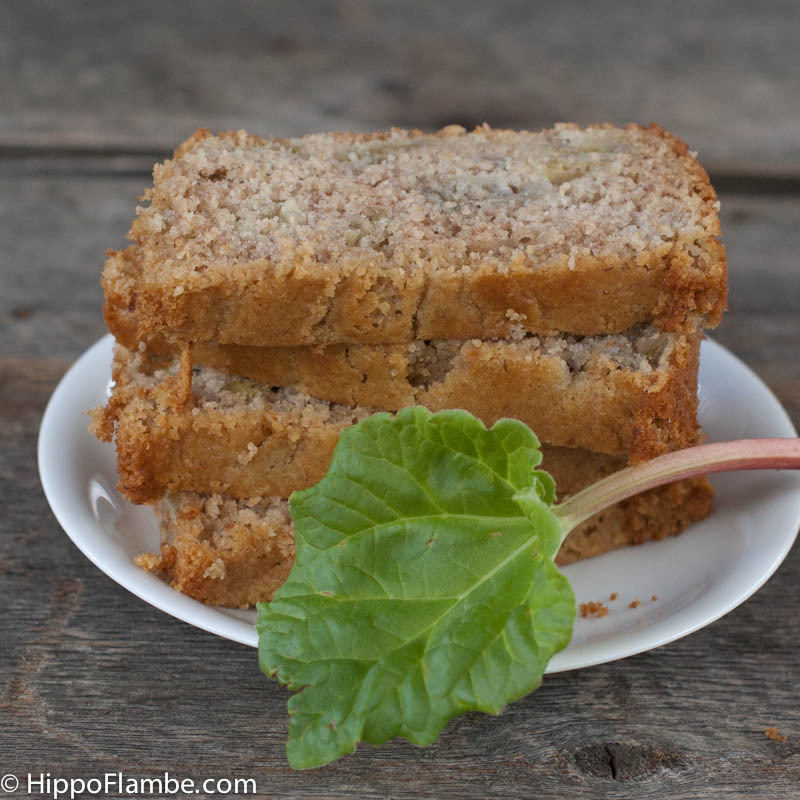 So now I have been experimenting with rhubarb pound cake, playing with different flours and spices to balance the tart rhubarb. This morning we had my most recent attempt for breakfast and at first both of my boys complained. "It's not sweet enough. Why is there no lemon in this. You should have made the other one." Once they were done complaining they both happily asked for seconds. Personally this version is my favorite, the flavor is rich from creme fraiche and barley flour with juicy interruptions from chunks of rhubarb. The barley in the batter not only adds flavor but it also makes the crumb fine and light. Plus, the lack of sweetness my boys complained about at first make this cake a perfect breakfast treat. 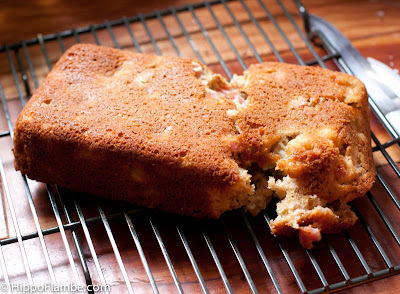 The crumb is so light the cake needs to cool completely in the pans before slicing or removing. A fact I discovered when I tried to put one cake on a cooling rack, as you can see in the photo above. Part of the lightness and fragility is from the barley flour, which contains very little any gluten and so does not have the structure of whole wheat flour. With half barley flour you don't have to be so nervous about gluten formation when mixing, it would still be possible to toughen the cake with over mixing but it might take a little work. The barley also has a sweetness and rich flavor that pairs really well with the rhubarb. Preheat the oven to 350°. Generously butter a 1.5 qt loaf pan. Melt the butter in a small saucepan and set aside while you prep the other ingredients. Mix the flours, sugar, baking powder, baking soda, salt and cardamom in a large bowl and set aside. Add the milk to a clear 2 cup measuring cup and add the creme fraiche until the total volume of the milk and creme fraiche is 1 1/4 cups (3/4 cups milk plus 1/2 cup creme fraiche is 1 1/4 cups). Add the eggs to the measuring cup and whisk the liquid ingredients well (I place the whisk in the measuring cup and spin the handle between my hands). Add the wet ingredients to the dry ingredients and stir a few times with the whisk before adding the butter and mixing until everything is fully incorporated. Add the rhubarb and fold in well with a spatula, making sure to fold all the way down to the bottom of the bowl. Pour the batter into the prepared pans and bake in the center of the oven until a cake tester or sharp knife when inserted in the center of the cake comes out clean, 45 to 50 minutes in my oven. Allow to cool completely in the pan before serving or taking out of the pan. Oh Robin your cake looks so moist. Thinking it would go great with a cup of coffee.